Ever had a toothache or a broken tooth? It can be miserable. Chances are, your pet has experienced dental problems, too. But just because your dog or cat doesn’t whine about it doesn’t mean she’s not in pain. 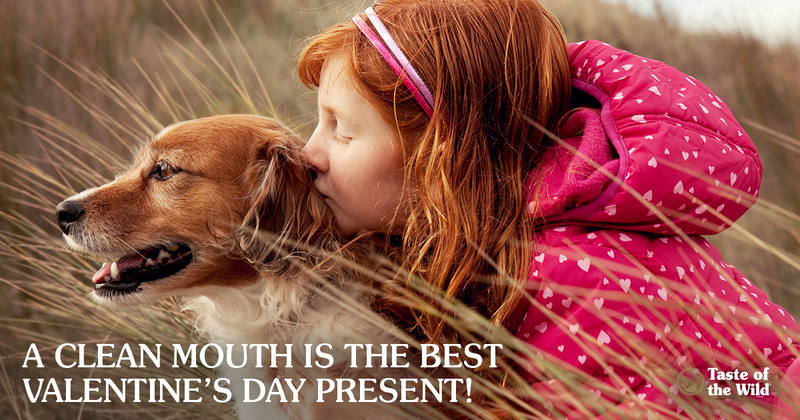 Since next week is Valentine’s Day (which happens to fall in National Pet Dental Health Month), why not give your pet the gift of a healthy, pain-free mouth? Now is the time to learn how proper dental care can help safeguard your pet’s health. It’s not normal for your pet to have bad breath. That’s often the first sign of trouble. Other possible signs include red, bleeding gums; loose, discolored or broken teeth; brown or gold buildup on the teeth; pawing at the mouth; drooling or dropping food from the mouth; loss of appetite and weight loss. But the biggest problem in pets is periodontal disease, which may not be visible to the naked eye. By three years of age, 80 percent of dogs and 70 percent of cats experience some kind of periodontal disease. The good thing is, it’s completely preventable. Periodontal disease begins when bacteria forms a sticky biofilm called plaque. Minerals in saliva combine with plaque and begin to harden into tartar in less than 24 hours. Plaque is easy to remove with a toothbrush, but tartar is hard and typically requires special instruments. Bacteria can then invade under the gumline, causing painful inflammation, gum recession and bone loss, ultimately resulting in tooth loss, too. In some cases, bacteria under the gumline can lead to broken jaws and unnatural holes between the roof of the mouth and nasal cavity. Since 60 percent of the tooth is under the gumline, it’s easy for damage to happen without anyone knowing about it. These same bacteria can spread to the kidney, liver and heart, causing organ damage. Brush your pet’s teeth regularly. That’s twice a day (just like you do yourself) or at least once a day, before plaque can harden into tartar. You can use a special brush that fits over your finger, a children’s toothbrush or even a square of gauze wrapped around your finger. Avoid human toothpaste, which can contain ingredients that cause tummy upset if your pet swallows it. Plus, pet toothpaste comes in tantalizing flavors like tuna and poultry. Schedule professional veterinary dental cleanings. With your pet under general anesthesia, your veterinarian can remove any plaque and tartar, including under the gumline. The doctor will also examine every tooth, using a probe to find pockets in the gums and X-rays to identify hidden abscesses and bone loss. While cavities are relatively rare in pets, cats can experience painful resorptive lesions along the gums. The doctor will check for those as well as any unusual tumors or growths. If necessary, the veterinarian can perform root canals, extractions or other dental procedures. Your veterinarian can determine how often your pet needs a professional cleaning. In general, small dogs and cats need cleanings more often than larger dogs. But regular at- home brushing can certainly extend the time before the next cleaning. Don’t give your pet hard treats or toys. By that, we mean real bones, horse hoofs, antlers and hard, nylon toys. Not only can these items break teeth, they can shatter and be swallowed, leading to a digestive tract blockage or laceration. Toys that bend or have some give are better choices. Check out other dental care products. Visit the Veterinary Oral Health Council’s website org for a list of approved foods, chew treats, dental wipes and water additives that can help reduce plaque and tartar. A healthy, pain-free mouth has other benefits: It doesn’t stink. All the better for smooching your pet on this Valentine’s Day.